It will be supported by a Scottish government awareness campaign aimed at improving public understanding of the wide-ranging nature of the problem. 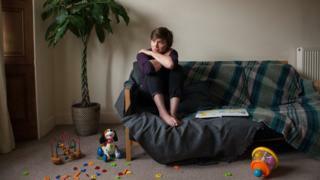 The Scottish Parliament passed the Domestic Abuse Act in February last year. Police Scotland said officers have been given extra training in preparation for the change in law. The legislation covers not just physical abuse, but psychological and emotional treatment and coercive and controlling behaviour, where abusers isolate their victim from their friends and relatives or control their finances. It takes account of the full breadth of violent, threatening, intimidating and other controlling behaviour which can destroy a victim's autonomy and further recognises the adverse impact domestic abuse can have on children. "This was a really bad situation for me, I wanted to live with respect as a person. "If you feel like you are in my situation being controlled or abused by your partner, seek help, it's your life." Assistant Chief Constable Gillian MacDonald, crime and protection lead for Police Scotland, said: "This new offence is groundbreaking. For the first time, it will allow us to investigate and report the full circumstances of an abusive relationship.